In a historic San Diego home, two baths and a new laundry bring attractive function—within the original footprint. 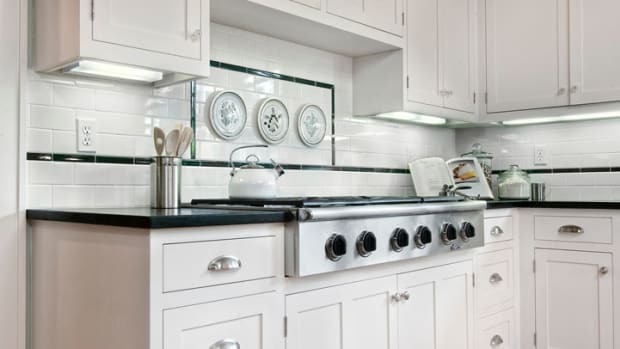 Luxury in 95 square feet—matching console washbasins and recessed cabinets make use of space. The glass doors opening to the balcony are original. 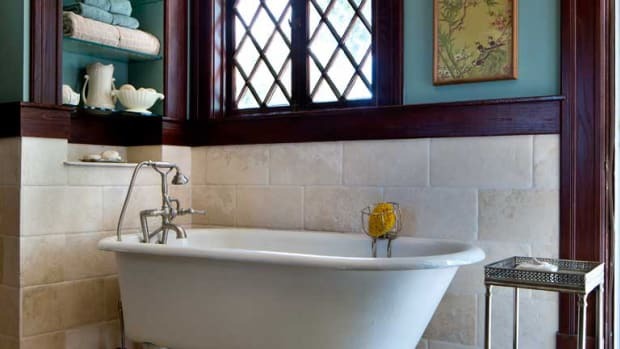 There’s a truism about renovating bathrooms in old houses: Without room to expand, you’ll have to pare down the wish list. 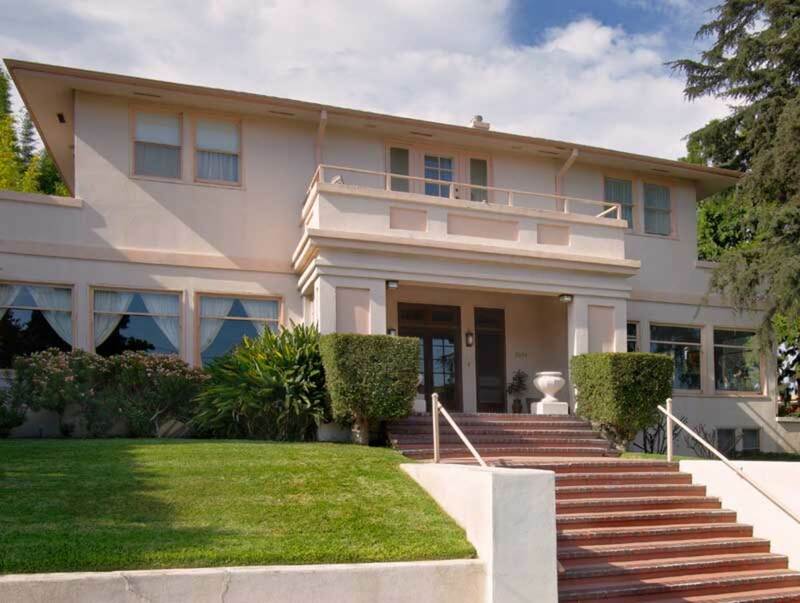 That was the situation facing the owners of Villa Orizaba, a historic and unusual house built in what is now San Diego’s Mission Hills neighborhood. It was built for the daughter of the captain of the U.S.S. Orizaba, a Victorian side-wheel steamship. Originally a Queen Anne villa, the house was added to and remodeled between 1888 and 1918, with the last iteration resulting in a Prairie-style dwelling. A glass corner shower makes the master bath feel spacious. The small room is fitted with a marble wainscot and a herringbone floor in white Carrara marble mosaics with an intricate border. 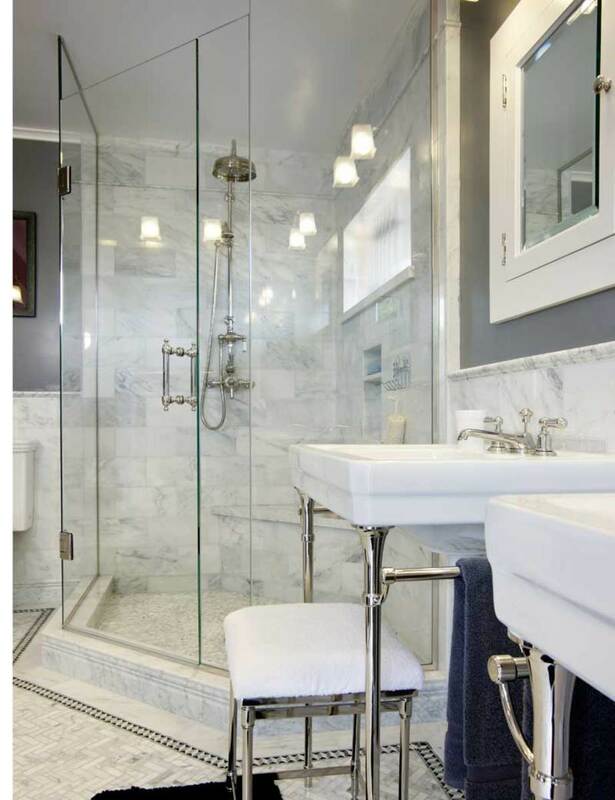 When Karen Mehalek and Tom Paluch arrived, they didn’t mind the renovated master bathroom. A dozen years later, though, they’d grown tired of its dated palette, its odd mix of Victorian and Arts & Crafts elements, and the closed-in shower that made the small room feel cramped. Intending to also renovate a guest bath and laundry room on the second level, the couple hired architect Ione R. Stiegler. In creating functional, related spaces, a primary goal was to maintain the historical integrity of the house. That meant sticking with the original footprint—no moving walls or adding on. Stiegler chose a roomy, glass-enclosed shower to open up the perimeter of the room and make its footprint feel larger. Luxurious touches include a rain showerhead and secondary spray, a built-in marble bench, a niche for toiletries, and a high window that provides natural light. 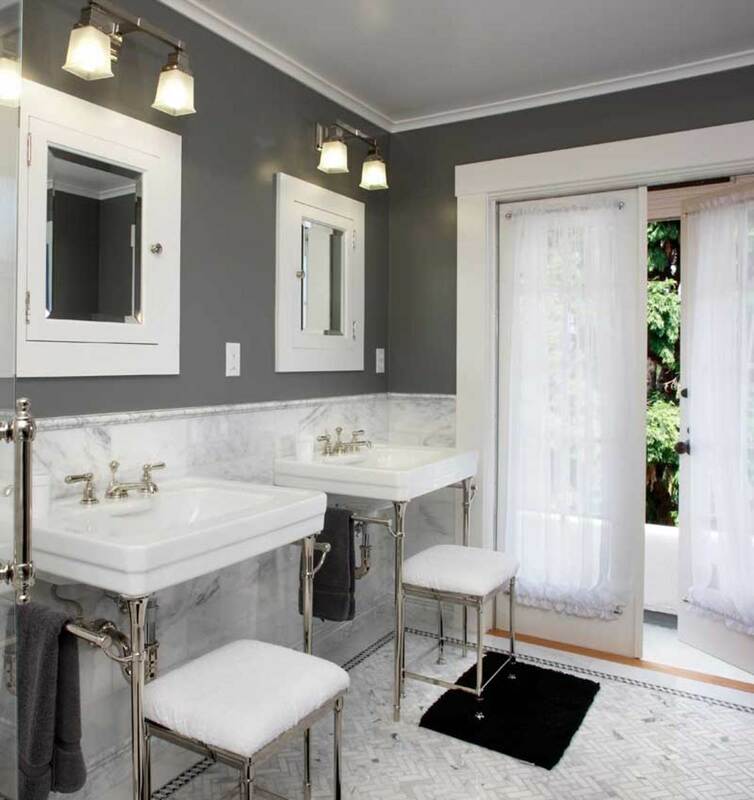 In the guest bath, twin pedestal sinks flanking a narrow chest of drawers and recessed medicine cabinets are space-efficient period elements. To save more space and add elegance, Stiegler selected side-by-side washbasins that rest on stands, rather than conventional built-in vanities or a unit with dual sinks. Period-style framed medicine chests recess into the wall. Both the floor and wainscot are white Carrara marble. 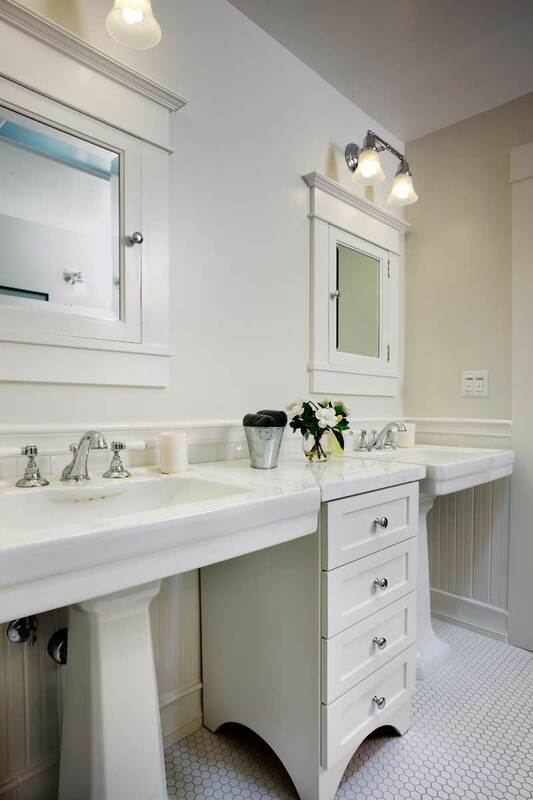 The play of white on white in floors, walls, and fixtures furthers the illusion of a larger space. Double French doors, original to the house and opening onto a balcony, visually extend the room and bring in light. An adjacent dressing room and a hall closet provide extra storage. In the guest bath, the owners were able to get the separate toilet closet they wanted, and also a deep clawfoot tub. 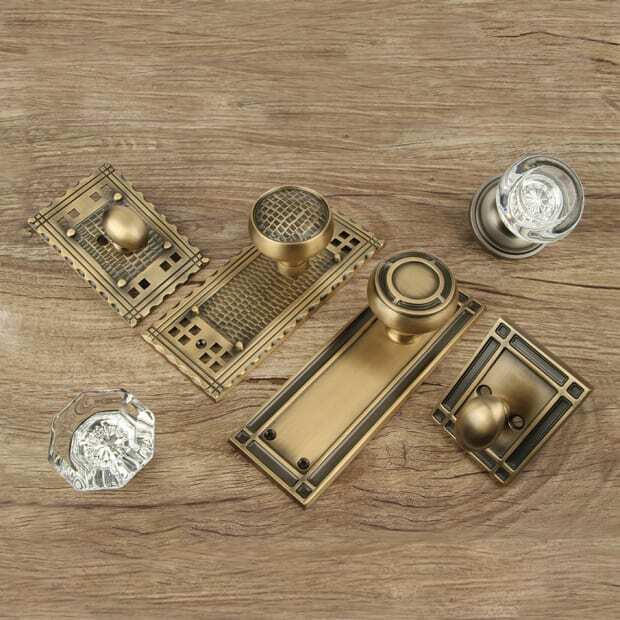 The style here is consistent with that of the master bath, but details are slightly less fancy, as befits a second bathroom: Identical basins rest on ceramic pedestals rather than console legs, for instance, and molding profiles are more pronounced. The floor is white ceramic hex tile instead of herringbone marble. Tucked between the sinks is a custom-built, four-drawer cabinet. 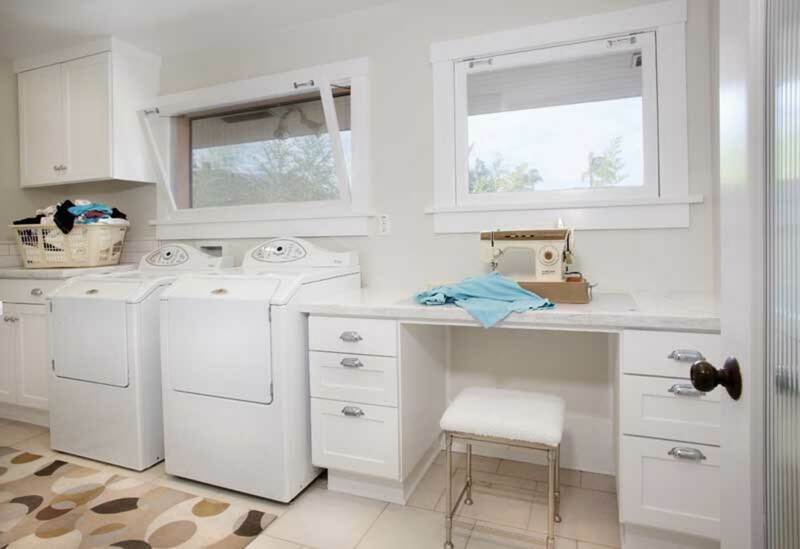 The new laundry has large windows for light and ventilation, and multi-purpose marble countertops. The freshly renovated laundry room continues in the same vein. Storage abounds with cabinets and a built-in desk/sewing counter. 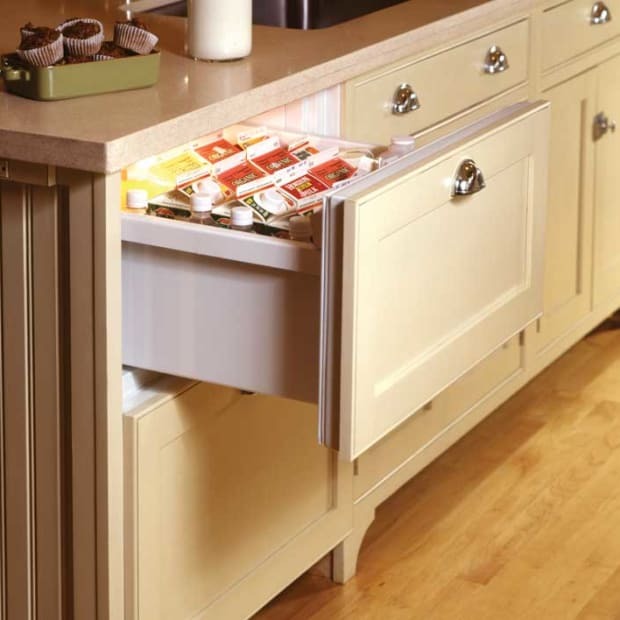 Doors and drawers have flat-panel face frames fitted with simple bin pulls. One especially clever idea: a towel bar that runs along one side of the room, ending above a tiled drain for air-drying delicates or sports clothes. 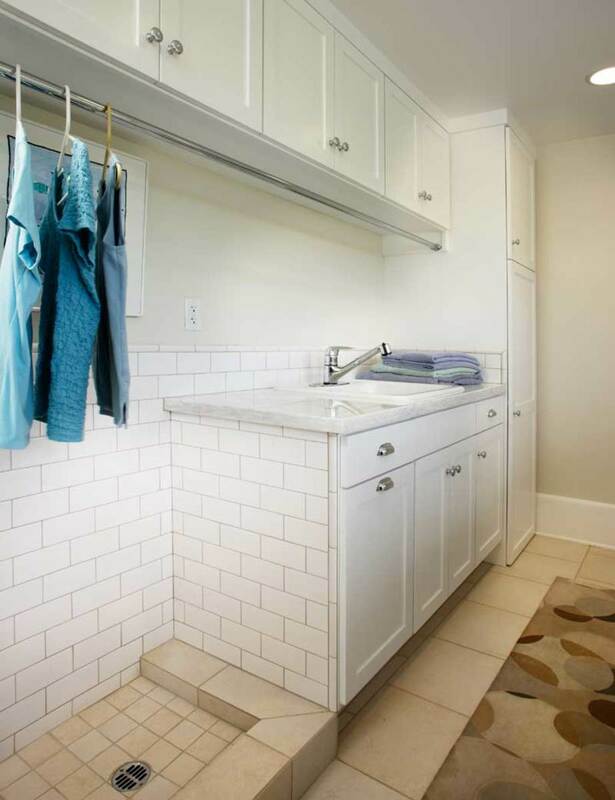 The laundry room is fitted with ample cabinets; a tiled floor drain facilitates clothes hung to dry (and messy wash-ups). 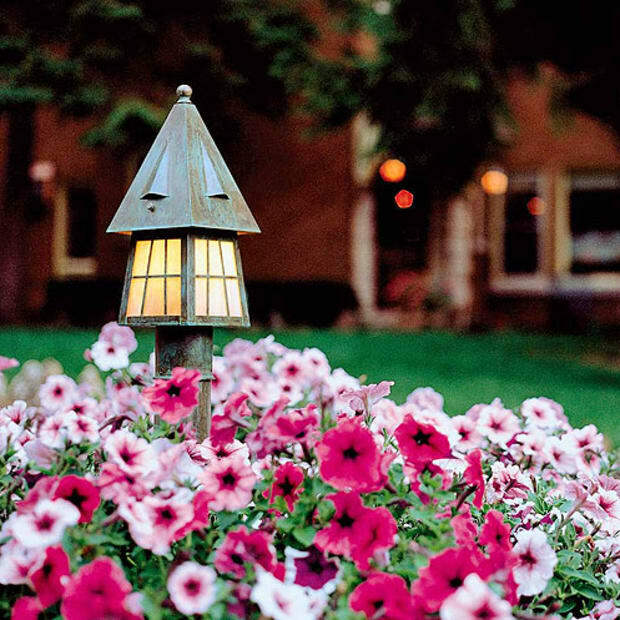 The house was built in 1887, and got a Prairie-style makeover early in the 20th century. 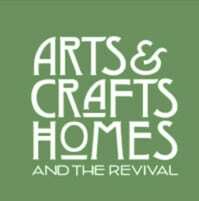 Giving up a bedroom allowed these old-house owners to enjoy two new bathrooms, masterfully designed.